In some ways, I like to equate watching films with eating. Sometimes, I’m really in the mood for a complex, sprawling, four-course meal: at those times, nothing less than the twistiest, most difficult foreign film will do. Other times, I want a good, hearty steak and look towards any of the numerous “classics” that I’ve re-watched enough to memorize the dialogue. There are times when I want a little lighter fare: those are always good opportunities for a music documentary, a slapstick comedy or an old musical. At certain times, however, there’s really nothing that will hit the spot better than junk food: gimme the cinematic equivalent of a Ho-Ho, from time to time, and I’m a happy boy. 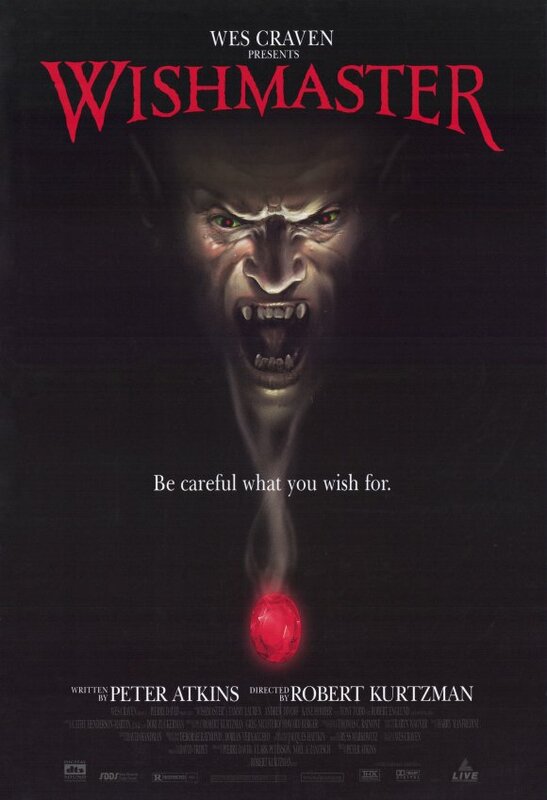 On those occasions when I want to turn my brain off, kick my feet up and satisfy my horror jones, there really isn’t much finer than the first Wishmaster, a snack-pack of goodness that I’ve been enjoying for nearly 20 years. Right off the bat, it helps to know one very important thing about Wishmaster: the film series began as the labor of love of Robert Kurtzman, one of the premiere special effects/make-up guys in the industry. Along with Greg Nicotero (any horror fan worth his salt should recognize this name immediately) and Howard Berger, he formed KNB EFX Group in the late ’80s. Naming all of Kurtzman’s projects would require its own separate blog entry but we’ll list a few that folks might recognize: Evil Dead 2, Phantasm 2, From Beyond, Predator, Tremors, Cabin Fever, Misery, Army of Darkness, Pulp Fiction, From Dusk Til Dawn, Scream, Boogie Nights, The Green Mile, Hulk…basically, if it was released in the past 28 years, Kurtzman probably had a hand in the makeup, effects work or both. As with other directorial efforts by special-effects experts, specifically Stan Winston’s Pumpkinhead and Tom Savini’s remake of Night of the Living Dead, the focus in Wishmaster is squarely on the astoundingly gory, over-the-top special effects, most of which are jaw-dropping…sometimes literally. The nifty hat trick here is that Kurtzman has taken an entirely serviceable idea for a B-horror film and tricked it out with an immaculate, shiny coat of candy-apple-red primer. As mentioned earlier, this is pretty much the epitome of junk food: delicious but nearly devoid of any actual nutrients. Wishmaster is like an amusement-park thrill ride: a blast to sit through but essentially incapable of changing your overall world view. As far as a story goes, Wishmaster is pretty lean and mean: an opening inter-title explains that there were once men, angels and djinn. The djinn didn’t want to play nice, despite their ability to grant wishes, and were banished to the furthest regions to prevent their complete destruction of humankind, an event which they can bring about simply by granting the same person three separate wishes. Cut to Persia in the 1400s and we see all hell (quite literally) bust loose as a djinn grants a king’s second wish. Before the djinn can grant the king’s third wish and damn humanity to an eternity of servitude, a court magician imprisons the djinn in a gemstone. Cut to the present and a drunken accident at a dock has led to the discovery of the gem: the gem changes hands until it ends up with Alexandra (Tammy Lauren), our spunky heroine. As can be expected, the djinn is eventually released and goes on a wish-granting rampage, all the while trying to get back to Alex: if he can grant her three wishes, mankind can kiss its collected asses goodbye. Will Alex be able to save the world? Will she be forced to use her third wish? Will the djinn help them throw the craziest party in 600 years? As if you had to ask! Let’s get one thing absolutely clear: Wishmaster will never win any awards for acting or its script but that’s not really why we’re here: we’re here because this thing is a party in a can. Decades before audiences thrilled to “in-on-the-joke” junk like Snakes On a Plane and Sharknado, we all had to make do with good, old-fashioned B-movies, films that took themselves at least seriously enough to avoid winking into oblivion. Wishmaster is a film with plenty of heart (all over the damn place, pretty much) and isn’t so terribly removed from the effects extravaganzas that Harryhausen created back in the day…just with a lot more viscera and exploded rib-cages, of course. Although the film is jam-packed with eye-popping moments, it’s book-ended by its two biggest, most extravagant set-pieces: the opening Persian bloodbath and Beaumont’s (Robert Englund) climatic cocktail party. Both scenes are chock-full of the kind of explosive effects that would be the centerpiece of any other film: someone turns to crystal and shatters, spraying deadly shrapnel around the room; a skeleton rips itself from a man’s body and stands for a moment, pondering the chaos, before running off to cause some more; a collection of bronze and stone statues depicting warriors from various countries and eras comes to shuddering life, in a scene that directly references Harryhausen’s classic films, and massacres a group of armed mercenaries; someone is cut to pieces by living, levitating piano wires, etc etc…In truth, the two aforementioned scenes actually pack in more amazing special effects moments than at least four lesser horror films combined. Even better, the effects are almost all practical, lending the film yet another point of reference to classic films like Clash of the Titans and The 7th Voyage of Sinbad. I’ve gone on and on about Wishmaster’s effects but what about the rest of the film? While it’s certainly not An Officer and a Gentleman, Wishmaster ends up being a pretty sturdily constructed affair. 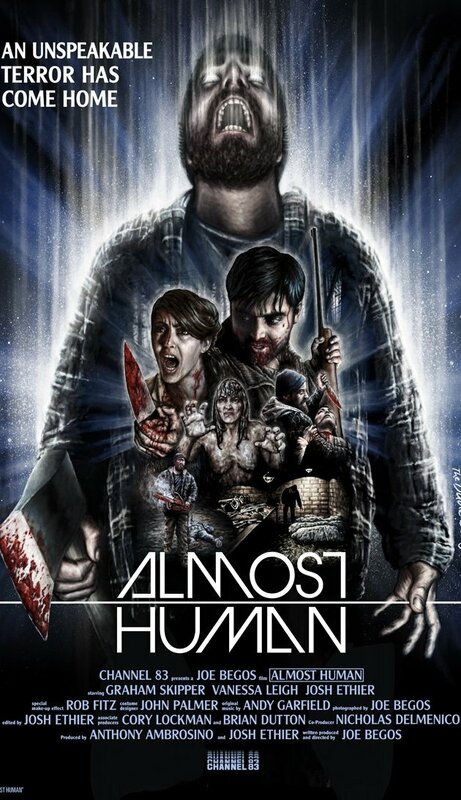 The film looks great, with a vibrant color palette that really lets the gore pop off the screen. In a nod to old-school horror fans, Friday the 13th’s Harry Manfredini handles the score and it’s a typically good one, even featuring a few pieces that directly recall the “adventurous” music from the aforementioned Harryhausen films. Wes Craven produced the film and, in many ways, it’s pretty comparable to the latter-day Nightmare on Elm Street films, particularly films like Parts 4 and 5, which tended to be more special-effects showcases than the earlier entries. The djinn even gets a massively ooky regeneration scene that manages to give both NOES and Hellraiser a run for their collective money. The acting, as can be expected from B-movies, is rather hit or miss. Andrew Divoff is a complete revelation as the djinn, playing the villain with just the proper amount of smarmy charm, deadpan sarcasm and dead-eyed seriousness. His quipping never really gets old (although it will get more tedious over the next few films in the series) and I’m constantly surprised that he never became a more prominent face in the horror world, similar to co-star Robert Englund. Englund is quite good as the slimy Raymond Beaumont and it’s also nice to get cameos from a couple other familiar faces: Candyman’s Tony Todd and original Jason Kane Hodder make appearances as a bouncer and security guard, respectively. They don’t get to do much but it’s still nice to see them. More problematic, unfortunately, is Tammy Lauren. As the lead, we get to spend an awful lot of time with Lauren and her progressively hysterical performance makes this a bit unpleasant, after a while. She’s alright for the first half of the film or so but she sets the controls for the heart of the sun after that and her overacting even begins to compete with the special effects, after a while. A lesser, but still noteworthy, issue is the rather lackluster ending: while necessary to paint the film out of its corner, it comes across as a real head-smacker and more than a little uneventful. If you can look past the film’s small handful of problems, however, I can see absolutely no reason why any horror fan wouldn’t love this movie. Here, at the very beginning, we saw the groundwork being laid for a franchise that had the potential to rival Elm Street for prime real estate on the horror map. If the series ended up dropping the ball and limping off the sidelines way too soon (Part 2 is merely okay, whereas Parts 3 and 4 are completely execrable), that does nothing to take away from the achievement of this first edition. Sometimes, I just want to kick back with an old friend and kill 90 minutes: whenever Wishmaster comes knocking at the door, I’m always ready to party.